From the attached slide it seems as if it is possible to "certify" grippers in relation to the rather new TS15066 and ISO 13849. However, as I also can understand it really depends on the type of application and the individual setting. 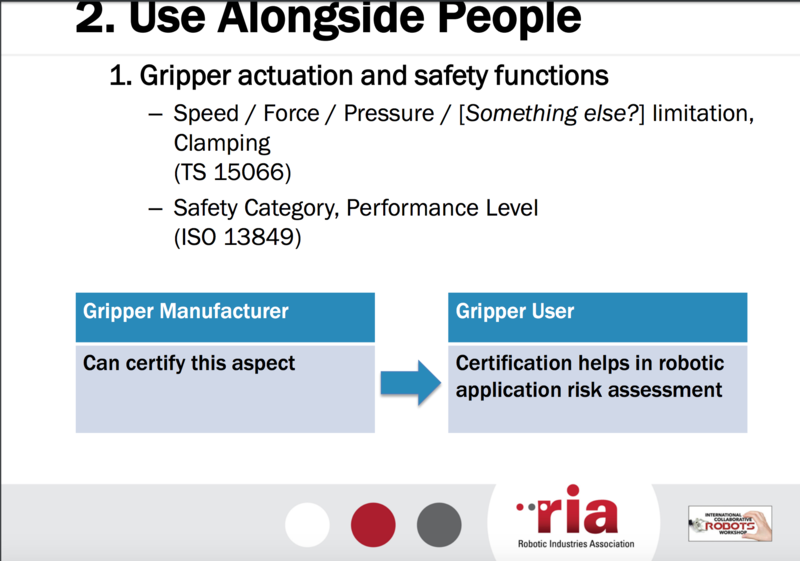 My first question is therefore: Does it make sense to certify grippers when the safety aspects are dependent on the individual application? Furthermore, if the Robotiq gripper (2F) can be certified in relation to safety standards, which safety standards / PL / cat does the gripper fulfill / comply with? Grippers can indeed be certified. But Robotiq didn't get their grippers certified even though they are used in many collaborative robot cells so far. As you pointed out, the real safety aspect in the end concerns the application itself. In the process of making a risk assessment, you will have to determine if the gripper is used in a collaborative way. Since you can limit the speed and force of Robotiq's grippers and cover the pinch points with protective gear, they most certainly can be used in a collaborative robotic cell. But even if the gripper was certified compliant to ISO/TS 15066, if the robotic cell packs sharp razor blades at high speed, this would not be considered collaborative...for instance. If you want to learn more about ISO/TS 15066 and risk assessments, I recommend reading our eBooks on that matter. You can find them all in the "Safety" section. Hope this helps. Thanks a lot. I have skimmed through the eBooks but I will take a closer look. So if you look only at the grippers, these can be certified (as stated in the slide)? If yes, are the Robotiq grippers certified / in compliance with ISO 13849 (PLd with Category 3 architecture) or something similar?